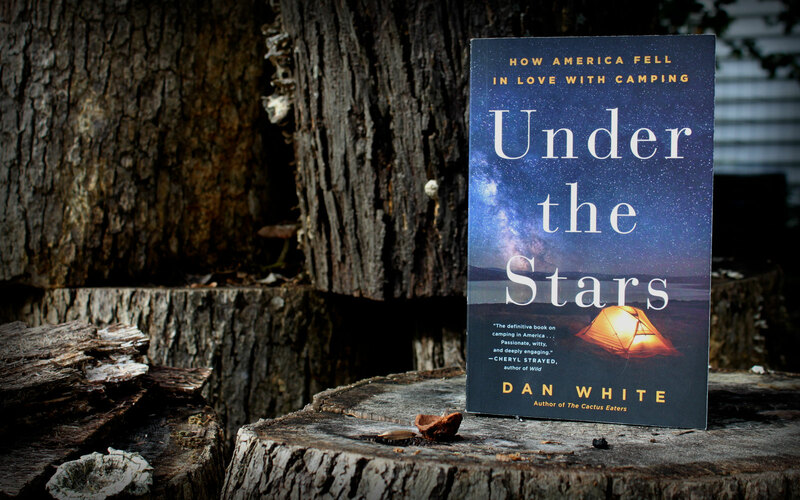 Under the Stars, by California-based author Dan White, can best be described as a travel log wrapped in a history book. White goes about recreating some of the great outdoors endeavors and movements in American history. He attempts to "see what they saw and do as they did", tracing the roots of American camping from Henry David Thoreau in the mid-1800's, to present-day phenomena like glamping and RV's. While most historians would credit William Murray's 1869 publication Adventures in the Wilderness as the beginning of the camping craze in America, White attributes the changing of our collective outdoors imagination to the influences of the transcendentalist movement led by Ralph Waldo Emerson. When fellow transcendentalist Thoreau published Walden, a reflection on his back-to-nature experiment in 1854, it got to the hands of John Muir and established its place in the history of camping literature. 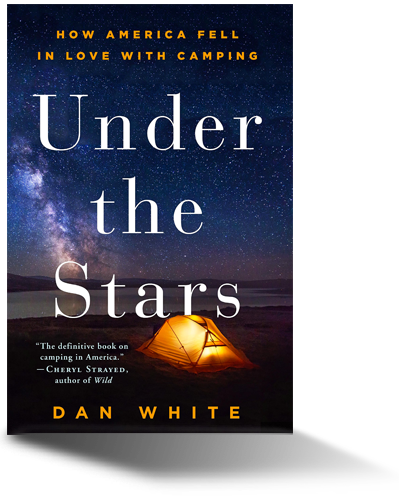 Imitating these Romantic era campers, White, in one of his re-creative outings, hires a North-Country wilderness guide and sets off on a high-peaks adventure in the White Mountains of upstate New York. Undertaking a more modern form of camping, White first traces the historical evolution of the RV before setting off on his own first person RV adventure through Arizona with his family. Along the way, he dispels his own RV lifestyle prejudices through chance encounters. "No wonder they infuriated me when I was young, skinny, and backpacking thousands of miles,” White muses. “To my mind they embodied passivity, crass consumerism, and giving up. If your fridge, your living room and your queen bed come with you, why go?" If you only read one chapter in the book, White's car camping section (“How's the Road?”) would be my pick. It’s the perfect combination of history, humor, and hijinks that reads like something from an intellectual version of Nationals Lampoon's Vacation, complete with antifreeze-crazed marmots and a death-defying passage on the Mineral King Road in Sequoia and Kings Canyon National Park. While I felt a few chapters could have been trimmed in both length and political undertones, I found myself moving briskly through the 390 pages and shared many of the more humorous passages with my wife during our evening reads. His section on 'Glamping' is especially entertaining where he compares his Safari West glamping accommodations to his own home back in Santa Cruz: "Our tent at Safari West, in comparison, was a pleasure palace. It had polished wood floors (our floors at home are stained linoleum slathered with an unidentifiable scunge), ... and a fully functioning toilet within the tent (the toilet at home is mostly decorative)." Oh, what $450 a night can buy! Four additional vignettes are sprinkled throughout Under the Stars, each highlighting an historical Hero of Camping. In one he covers George Washington Sears (who is perhaps the father of “kayakpacking”) and his 266 mile paddle through the Adirondacks on his 10 and a half pound canoe the Sairy Gamp. In another, he cleverly positions s'mores as a hero of camping – a sentiment which we fully support. Who knew the 1927 Girl Scout manual gave rise to this camping staple? White, a Thoreau-inspired outdoorsman, is an accomplished camper and hiker who has a thru-hike of the Pacific Coast Trail under his belt. In his book, he mixes his personal experiences with poignant – and at times laugh-out-loud – humor to bring historical figures and camping movements to life. Having the benefit of hindsight and modern equipment, the re-creation of the adventures of our camping forefathers is a great way to draw the present day camper into the history of the activity. Disclosure: Some of the links in this post are Amazon or other affiliate links. An affiliate means that if you make a purchase, Campfire Delight receives a small compensation at no added cost to you. We only recommend products that we truly use and love, and any purchases you make helps us keep the lights on and the kittens fed. If you have any questions about products featured on our site please email us. ‍Thank you for your support.